Since this review has been published, HP informed us that the sample sent to us is for the US market only and UK retailers are only stocking the 7200U version. We have reached out to HP to find out why different CPU SKUs were being used in the same product line. The HP EliteBook x360 1030 G2 is the company’s mainstream device for those looking to grab a laptop that can also double as a tablet if needed. It is the company’s cheapest convertible notebook and competes with the likes of the Lenovo ThinkPad X1 Yoga and Yoga 370, the Toshiba Portege X20W-D, as well as the Dell Latitude 5289, 5285 and 7389. HP Inc embraced a more conventional design for the EliteBook x360 1030 G2. It looks very similar to the Spectre x360 and shares the good looks of that machine minus the dark ash silver finish. Instead, we’ve got a more traditional brushed aluminum colour with the new logo. At 317 x 218.5 x 14.9mm with a weight of 1.28kg, this notebook has a bigger footprint than the Dell Latitude 7389 or the Lenovo ThinkPad Yoga 370, with the Toshiba Portege X20W-D beating them all. But the EliteBook x360 doesn’t feel overtly heavy or unwieldy; far from it. Obviously, don’t expect to use it for a whole day at arm’s length in tablet mode – that would be a bit too much to ask. Instead, nomadic out-of-office workers will appreciate the small form factor and how featherweight it is when using the device as a traditional laptop (with occasional tablet usage thrown in). However, it’s a shame about the bland-looking power supply unit which, together with the obligatory power cable, adds more than 50% to the weight of the laptop should you want to carry all three around. The design traits usually associated with high-end laptops are all here. Razor sharp edges? Check. Chamfered front? Check. Tapered profile? Check. Glass-coated precision trackpad? Check. The CNC aluminum unibody frame and diamond cut accents are at odds with the fact that this laptop has a thick skin. It has been designed to pass 12 MIL-STD-810G testing. Note that the testing itself is “pending” according to HP, and the company also goes on to warn that any damage caused by the user trying out such tests will need to be covered by the HP Accidental Damage Protection care pack. Two hinges allow the device to transform seamlessly from a traditional laptop into presentation mode, tent mode, or a tablet mode. On the right side of the device you’ll find a microSD card slot, one USB Type-C connector (SuperSpeed format), a full-size HDMI connector, a full-size USB port and the proprietary power connector. We’d prefer to have a generic USB Type-C connector instead of the latter. The power button is located on the left edge along with a second USB port (SuperSpeed), physical volume rocker buttons, an audio jack and a smartcard reader. The US laptop is slightly elevated, providing enough space underneath to facilitate airflow through the slits at the rear and underneath the laptop. There’s also a fingerprint reader sitting on the far-right edge of the laptop, one that supports Windows Hello authentication. Two speaker grills are located underneath as well, powered by Bang & Olufsen technology. All in all, there are four speakers. Oddly enough, the models available on HP’s website come with the slower Core i5-7200U or the faster 7600U processor. Tthe 7200U doesn’t support vPro – Intel’s enterprise management platform – and it’s slower than the 7300U CPU present in the model we tested. The HP EliteBook x360 1030 G2 is also available with 16GB of RAM and a 512GB SSD. To further complicate things, the EliteBook can also be purchased with an integrated privacy screen (SureView), a built-in 4G modem, and an NVMe SSD which should deliver better performance than the SATA-based storage subsystem in our review model. The screen has a layer of Corning Gorilla Glass on top of the 13.3-inch Full HD panel. It is sufficiently bright in an office environment, with minimal glare evident, and delivers punchy colors with good contrast. In short, it’s more than adequate for normal enterprise usage. Sadly, the HP EliteBook x360 doesn’t get the micro-edge bezel treatment of the Spectre x360. In other words, the top and bottom bezels are large – the top one to accommodate the two microphones and HD webcam, and the bottom one to help with holding the device in tablet mode. Both the keyboard and the touchpad are up to scratch. 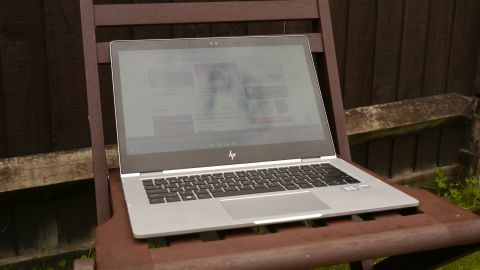 More expensive devices tend not to skimp on these elements, and this EliteBook is a good example of what can be achieved with input peripherals given a proper budget. The backlit, spill-resistant keyboard has generously-sized keys (called Durakeys) with good travel and excellent feedback. They’re a bit too noisy but that’s a rather subjective matter. There are four dedicated buttons on the top edge that fire up your Outlook calendar, initiate screen sharing, and start or end a call (those last three functions are achieved through Skype For Business). The touchpad is a single slab affair without any physical buttons; the surface is depressed and surrounded by a very thin chamfered silver border.